When you have to deal with complex pedigrees, printing can become as complex as the family but not with PedigreeXP! Thanks to a smart printing engine, printing is easy and customizable. 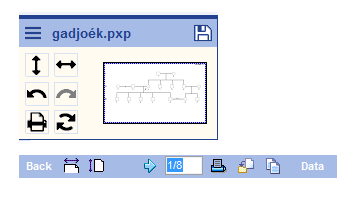 To customize the printing area, right click on the Pedigree drawing and choose “Set print area”. Divide the pedigree into several pages and change their size. You can move the print area by dragging the horizontal or vertical lines with the mouse. Moving the print area increases or decreases the amount of pages to be printed. Choose the page layout: you can set whether you want to perform the printing in landscape or portrait mode by clicking on the arrow (displayed in the middle of each page). Select only the pages you want to print: with complex and large pedigrees there might be parts of the drawing that are unnecessary to print. To deselect pages, untick the box in the middle of the page that should not be printed. The page will turn grey. Flip through the pages to make sure you are satisfied with their layout. To print simpler pedigrees, it is possible to print directly from the navigation window (top left corner) or from the properties panel. PedigreeXP will optimize the printing layout of your pedigree drawing and print all pages directly. How to automatically detect carrier females of X-linked condition with PedigreeXP?